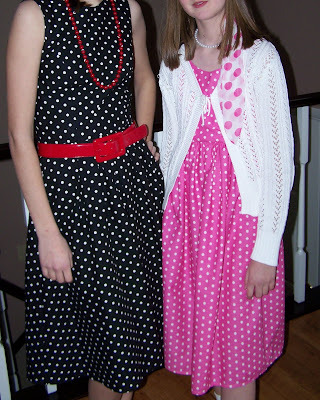 There was definitely a point in which they preferred the dresses Grandma bought them over my handmade ones, but when we were searching for an appropriate dress for Confirmation, I was dismayed at the choices for a 12 year old. Everything dressy was strapless or skimpy. We did eventually find one that we all agreed upon, but at that point I realized I would continue sewing for them. At the same age my daughter started playing piano for a Cleveland youth chorus. They practice weekly, up to four times a week, for a Christmas show and a spring show. The new show is debuted at the beautiful Allen Theater and then they continue to perform at many other venues throughout the area ranging from nursing homes and local community theaters to outdoor tree lightings and summer gazebo concerts. (My son has been playing for the chorus just a bit longer than my daughter – he plays piano, guitar, drums and sax.) The chorus members have very strict uniform codes – even when they travel or arrive at an event out-of-uniform, so I wanted to be careful to select something appropriate for my daughter. Since I felt a pianist should be in black, we decided to make a simple cotton dress which was black with white polka dots. 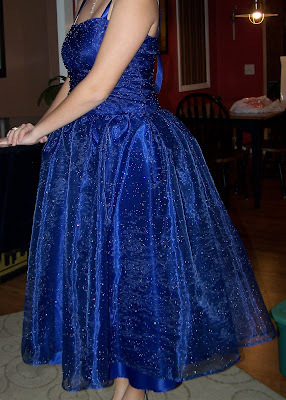 It had a fitted bodice and gathered skirt. She accessorized it with a red belt, shoes and necklace. She, being practical-minded like her parents, continued to get plenty of use out of the dress. She wore it for Easter (matching her little sister), to her 8th grade graduation, and to many other events and concerts that year. I wanted to keep the color black, but selected a silk dupioni fabric to add a touch of glamour. We also went from sleeveless to a narrower, gathered sleeve. We made two wide belts, one in blue and one in green, that she changed for the various concerts that season. The kelly green shimmered, the bias cut flowed – everything about it said 1930’s glam. 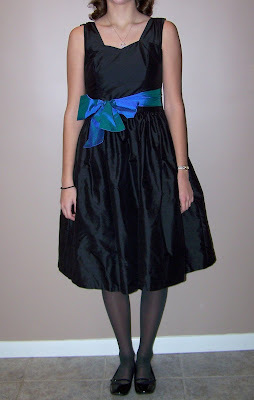 So that winter, in preparation for the Christmas concert, I had in mind a retro-style, bias-cut dress in kelly green. My daughter shared my vision (of course, we were going to try to find a pattern that was not skimpy and backless on top). We struggled to find a bias-cut pattern, but eventually found this “retro” pattern. It was not a true bias-cut, but it shared the feeling of one. The outcome was what we were trying to achieve: a glamorous, elegant, floor-length dress. certs, and I simply do not have the camera and/or photographic skills to capture these dresses properly.) The dress was a hit. She looked so elegant on the stage. Who says a pianist must always wear black! Keeping in mind that the musician’s are not the focus of the show and balancing that with the motto: “it’s better to beg for forgiveness than ask for permission”, my daughter wanted something with more color for her spring show. 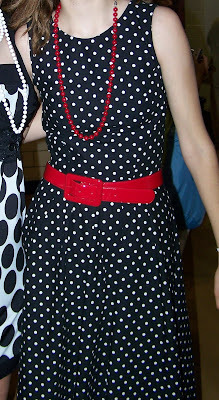 We have steered toward short dresses for the spring concerts and this time chose a vintage 1950’s look. She selected the color and I, again, chose silk dupioni. I love working with silk. It has a bit of give in it and lays so nicely. It has a sheen, but is not shiny. I think this is my favorite dress. 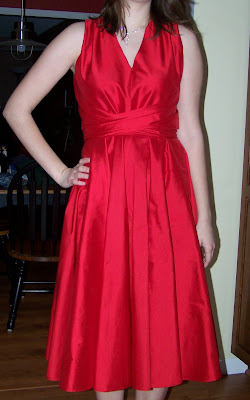 This year, Grandma (whose passion is to shop) found some fantastic formal dresses for $15. They looked beautiful on my daughter and, being the tired, old, mom that I am, I thought one of them would be perfect for her Christmas concert. But, “it’s tradition, Mom.” And I agreed. 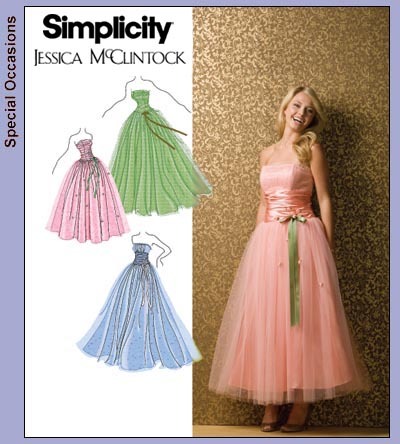 This year, my daughter wanted something girly and poofy, so she selected this Jessica McClintock pattern. 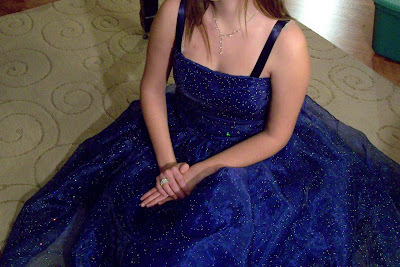 She chose a deep, cobalt blue and wanted the fabric overlay version – not the tulle version. It took oodles of yards of fabric and, with a bejewelled overlay, was not easy to gather. I added ribbon straps because she plays piano and also turns pages and it’s completely appropriate. And, it peeves me to see girls wearing strapless gowns always fussing with pulling them up. (I can’t tell you how often I see this at weddings.) My type-A-ness finds some flaws in this dress and the photos do not do it justice, but my daughter thought it was the “best one ever.” All the littlest girls in the chorus kept coming up to her and touching the dress. They thought she was a princess. I love this! It must be so nice to do this for your daughter! You are so talented- every one of those dresses is beautiful! I especially love the black polka-dot dress- I would totally wear that myself! What a lovely fashion show you made for us :o) I love all the dresses! Wow, I’m so impressed with your sewing skills. Your daughter is fortunate to have such a talented mom. 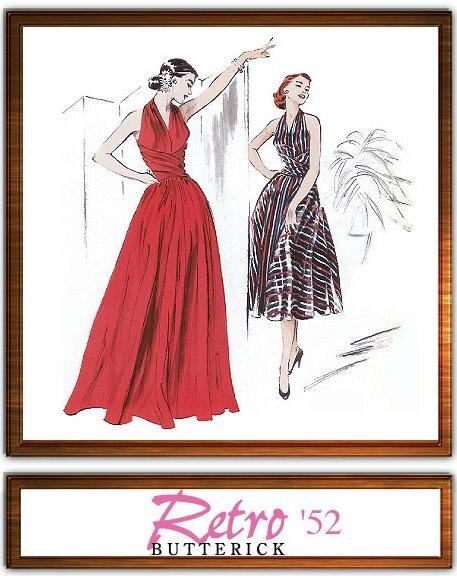 I love all of the dresses, but particularly liked the green one based on the “retro” pattern. Thanks for sharing all of those gorgeous dresses. I think I enjoyed watching Kelly Osbourne on Dancing with the Stars for the same reason. It was a joy to watch her transform in to an elegant lady and to see her much-deserved pride in herself. Handmade dresses beat store-bought any day! Wow, you are wonderful, a lot of hard work but sooo… beautiful I love sewing dresses for my girls. This past Easter I found vintage 50’s patterns, modified them a bit and made Easter dresses, I love them too! Gorgeous dresses!!! My mom used to sew all of my clothes for me until I was ‘too cool’ for that. But now I wish I hadn’t asked her to stop! You are way talented! What beautiful dresses… When I was younger I sewed most of my clothing… now I should again… one commodity is missing… the most precious of all…. time! Thanks for showing off your gorgeous dresses! You’re incredibly talented – each of these dresses is gorgeous! I esp love the polka-dotted shift, and your daughter’s accessories made it the perfect outfit. What beautiful dresses! Your daughter is a very lucky girl. they are of course all wonderful – but I LOVE the polka dots! your daughter is lucky – she would never find something so perfect and unique each year in a store! All of these dresses are gorgeous! Especially the glittery cobalt dress. It’s so special that you and your daughter work together to choose a pattern for each of her shows. It is so hard to decide which are my favorites!!!!!! 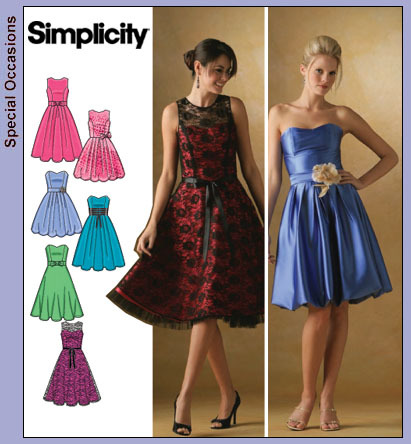 !……but I will go with the red dress and the blue princess…….love them all. You are a very talented woman, Jane! Thank you for sharing with all of us!!!!! Thanks for sharing all of these!! They’re all beautiful. I agree with you totally, my daughter is not yet five and I’m already dismayed at the things I see in her size (heels, on a 4-year old, really?) I hope she remains as happy with handmade as your daughters have!! 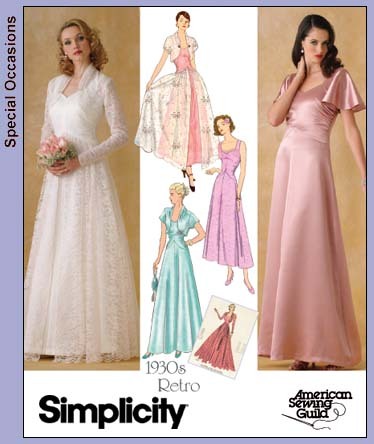 I LOVE them all of course…I especially love the bias cut…that vintage look! You are incredibly talented!